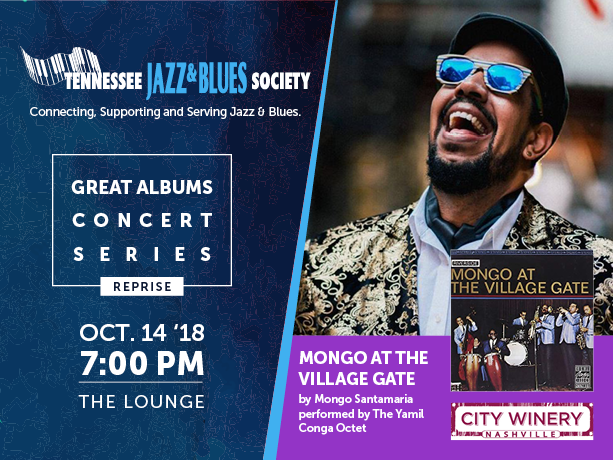 TJBS closes out Hispanic Heritage Month by reprising last month’s performance “Mongo at the Village Gate” by Mongo Santamaria featuring the Yamil Conga Octet. This performance will feature songs from “Mongo Explodes at the Village Gate” including his smash hit, Afro Blue. Sunday, October 14, 2018, in The Lounge at City Winery Nashville. Doors open at 5 pm and the show begins at 7 pm. Tickets are $20 and can be purchased from City Winery’s website. In September 1963 “Mongo at the Village Gate” found Mongo Santamaria entering the boogaloo era with a variety of funky pieces that show the influence of R&B and soul-jazz without losing the group’s roots in Cuban music. The infectious live set teamed the conguero with trumpeter Marty Sheller, the reeds of Pat Patrick and Bobby Capers, pianist Rodgers Grant, bassist Victor Venegas, drummer Frank Hernandez and the percussion of Chihuahua Martinez and Julian Cabrera. Songs like “Fatback,” “Mongo’s Groove,” and “Creole” have happy, soulful, and simple melodies. This is one of Marty Sheller’s best dates on trumpet, while Santamaria takes “My Sound” as a colorful unaccompanied solo. “Mongo Explodes at the Village Gate” brings the Mongo intensity and sound back the Village Gate two years after his first set. Latin Percussionist Yamil Conga is a versatile musician and powerhouse who is known for exciting congas, immersive timbales and dynamic drumming. Salsa and musical talent runs in Cong a’s blood with a direct connection to Mongo Santamaria. When asked to perform at this concert, Conga said that he got chills because his father, Eladio Jimenez, sang with Mongo Santamaria so getting this opportunity to perform the works of Mongo Santamaria was an honor. The talent and soul that Yamil Conga has was evident on Sunday night during his performance and was a great way to celebrate local talent, Latin jazz and Hispanic Heritage Month. Becoming a dominant presence in the Nashville music scene, Yamil has risen to cement his place as a top Latin percussionist and as an entertaining and a natural performer with flare. Click the City Winery logo to purchase tickets!